We specialize in screenprinting, embroidery and custom full-color or single-color heat transfers on a wide variety of high quality garments. Cagle Designs® has built a one-of-a-kind reputation for exceptional customer service, high quality work, combined with very fast turnaround and competitive pricing. On all orders, big or small, Cagle Designs® will take care of all of your custom apparel needs. T-shirts, sweatshirts, golf shirts, hats, jackets, denim, tote bags, aprons, and much more can be seen by clicking on our catalog links. If you don’t see what you’re looking for, please give us a call or e-mail your request. We have many supplier resources at our disposal. *Please make note of the specific item/style number, colors and quantities of the items you would like included on your estimate. Whatever your style, Cagle Designs can make it happen. We have the capabilities to print up to six custom inks and offer a huge selection of apparel styles and colors. With up to 6 colors, your designs will certainly be recreated by our separation process with stunning clarity and resolution. Our screen printing experts have extensive experience and are fanatical about quality. We guarantee you will be satisfied with your finished product. • Please call us at 806.244.7446 or use our online quote request form for a detailed quote. Once a design is approved we have a normal 14 business day turnaround and have rush order service available. We are happy to accommodate any timeline whenever possible. We offer quick and accurate digitizing/embroidery services on a large selection of apparel and accessories in many styles and colors. High-quality embroidered apparel will leave a lasting professional impression on your clients. Embroidered artwork has a sophisticated feel that works well on high-end business apparel, sportswear, caps and more. Any design can be embroidered, but first it needs to be converted into a format that is accepted and readable by the embroidery machine. That conversion process is called “digitizing”. The digitized file tells the embroidery machine where, how and which colors to use while stitching. We provide a quality, professional digitizing service focused on “sewability” and completed quickly at the best price available. Embroidery is a technique of decorating apparel, fabric or other materials with a needle and thread. 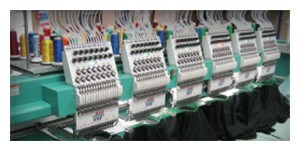 In our case, it is done by a machine that has multiple heads and is attached to a computer instructing it how to embroider the item. The customer’s artwork is digitized and then goes into the embroidery program where it is then read by the machine. denim, hats, tote bags or even t-shirts with your brand. Pricing is determined by the number of stitches in the design. Keep in mind that embroidery is primarily used for smaller logos. 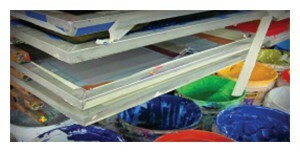 After a certain size, it may be more cost effective to consider screen printing. For example, large colorful prints on t-shirts or jerseys. Once a design is approved we have a normal 14 business day turnaround and have rush order service available. We are happy to accommodate any timeline whenever possible. Full color and single color decal cut heat transfer. Full Color Logos on any color garment. This process is also more cost-effective for small orders and designs with many colors. This makes full color decal cut a popular choice for short-run personalization. Get that extra personalization you’re looking for. 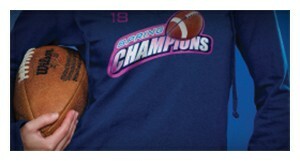 Personalize team uniforms, bags, t-shirts, and more! Customized names and logos that can be printed or cut in any color.